Be the first to share your favorite memory, photo or story of MRS. MARTHA. This memorial page is dedicated for family, friends and future generations to celebrate the life of their loved one. 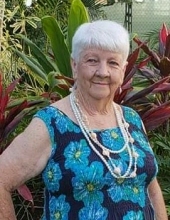 Mrs. Martha Ann Ledbetter Fortner Conner, a resident of Tallassee, Alabama, passed away Sunday, March 24, 2019, at the age of 78. Funeral services will be held Thursday, March 28, 2019, at 11:00AM at Elam Baptist Church with Rev. Gene Bridgman and Rev. Jimmy Allen officiating. Burial will be at Liberty United Methodist Church Cemetery, Jeffcoat Funeral Home directing. Mrs. Conner is survived by her children, Dianne Fortner Wright, Donnie Fortner, Denise Fortner, Andrea Fortner Ward and Cherie Smith; grandchildren, Haley Pearson (Jason), Torie Meadows, Joshua Jones, Naullie Fortner, Caleb Flowers (Carla), Austin Floyd, Adrianna Floyd, Luke Ward, Sami Hardy (Matt) and Wes Smith; Ten great grandchildren; brother, Freddie Ledbetter (Francine) and her sister- in- love, Phyl Ledbetter. She is preceded in death by her parents, Crawford and Dossie Ledbetter; brothers, Curtis Donald Ledbetter and Henry Andrew Ledbetter. Mrs. Conner is an accomplished mother who worked hard her whole life and had a beautiful soul. She loved her family and friends, Auburn football and her Lord and Savior Jesus Christ. She will be greatly missed by many. The family will receive friends Wednesday, March 27, 2019 from 5:00PM to 7:00PM, at Jeffcoat Funeral Home, Tallassee, Alabama. To send flowers or a remembrance gift to the family of MRS. MARTHA ANN CONNER, please visit our Tribute Store. "Email Address" would like to share the life celebration of MRS. MARTHA ANN CONNER. Click on the "link" to go to share a favorite memory or leave a condolence message for the family.